This type of information is not normally recorded on this type of building. At this date community buildings, such as libraries or town halls, might have a foundation stone or plaque with these names but we know of nothing like these shells anywhere else. And, we have to ask, why shells? If Hunt & Crombie had been crustacean merchants we could have understood but they were spice merchants, so why not cloves, or cardamon pods? The mice are at ground floor cornice level at the juncture between number 13 Philpot Lane (Jamies) and 23 Eastcheap (Caffe Nero). The shells are on number 13, below the ground floor cornice. Italian gothic in style, the two addresses are parts of the same, listed, building. Geograph has a fine photo and architectural appreciation and says "It was built in 1861-62 as offices and warehousing for Messrs Hunt & Crombie, spice merchants. 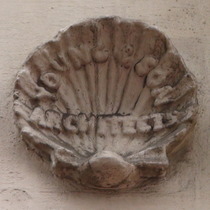 The architects were John Young & Sons." Which confirms the contents of two of the shells, and we have no reason to doubt the third. Spice merchants active in 1862. No inscription though there were some information panels.